If you pick up this book because it was the inspiration for the George Clooney movie, Leatherheads, you might be disappointed (depending, I suppose, on how much you liked the movie). But if you choose to pick up this book because you are interested in history, or football, or even the sociology of ‘entertainment/sports’ through history, then this is a must read for you. I first became interested in this after visiting the Football Hall of Fame and seeing the display for the Duluth Eskimos. I wasn’t aware, at the time, that there had been such a team, and with a strong connection to Duluth (immediate family having lived and currently living there), I was instantly intrigued and looking for more information about the team. Fortunately, I came across this book. The Canton Bulldogs won the league championship…finishing undefeated with ten wins and two ties. … The Bears finished second with nine wins and three losses. The Packers were eighth with four wins, three losses, and three ties. Wisconsin’s other team, the Milwaukee Badgers, were in eleventh place with two wins, four losses, and three ties. And Minnesota’s team, the Minneapolis Marines, finished thirteenth with one win and three losses. Four games. Nine games. Twelve games. It was no wonder that at least once two different teams both claimed to be the league champions (this was LONG before the Super Bowl). 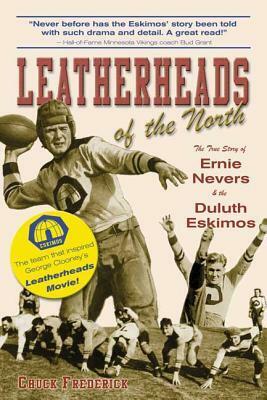 Just the amount of football history that is packed in this little book is amazing, but the detail of the Duluth Eskimos and their star, Ernie Nevers, is tremendous. Much of the information comes down through stories told by team members, many years after the fact, and sometimes as told by descendants of the original players, so one has to take the stories with a little bit of a grain of salt, but even so, we are talking about an era when rugged men played football with leather helmets and ran into one another like long-horned rams. The Eskimos were the first team to hold a pre-season training camp, and to feature a team logo on their uniforms. In today’s era, it’s hard to fathom that either of these were not regularly done! I really enjoyed this book, mostly from a history point of view, but getting a sense of football when it wasn’t played for the money (or even, necessarily for the fame) was also quite enjoyable. Looking for a good book? History, Minnesota History, sports history, or football fans will appreciate this well researched and thoughtful look back at a professional football team that most have never known about, but sent three members of its squad to the Hall of Fame and possibly kept the sport of football alive during some tumultuous years.